I suddenly feel an overwhelming urge to post another House Guest Haiku (see previous post). Aloha woman! 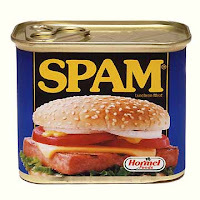 We islanders LOVE the smell of Spam. Here in Hawaii we play extra for the smell of Spam in our fridges. Ooooh, love the haikus. I wish I had such an elegant way to rant. I don't think spam has ever entered our home. Tuna either. My kids are deprived. I wish I could use Haiku effectively. I think so do my readers. I think my comment is longer than your post. Why all the short choppy sentences? I don't know.